Wash lentils. Place in a medium-sized saucepan, cover with water, and bring just to the boiling point. Turn the heat down, partially cover, and allow to simmer without stirring for 20 minutes or until tender but not mushy. Drain well, and then transfer to a large bowl. 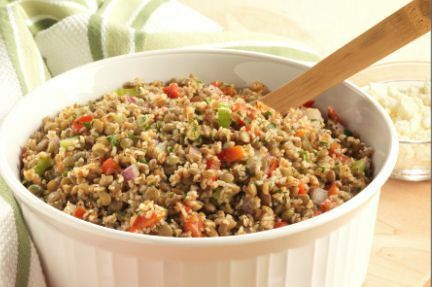 While the lentils are cooking, place the bulgur in a small bowl. Add boiling water, cover with a plate, and let stand 10 to 15 minutes. Add everything to the lentils, except tomato chunks, walnuts, and lemon wedges if using. Mix gently but thoroughly. Cover tightly and refrigerate. Just before serving, top with tomatoes and walnuts. Garnish with lemon wedges. The mix of flavors and textures is phenomenal...i left out the garlic and celery and added diced tomatoes and black olives and feta. Very Mediterranean! Reminds me of tabulli! Try this one!